When you are involved in long ongoing beer projects, the typical situation of beers seeming to take forever to complete (even though you’re waiting at most a month), get’s turned around and things move much faster than you’re prepared for. (Hence my ridiculously late Sour Brown bottling earlier in the year) The Lambic Project is no exception, and by the time we thought of it the date was upon us. So we threw together a little BBQ for our investor/friends, so we could see how things were moving along. 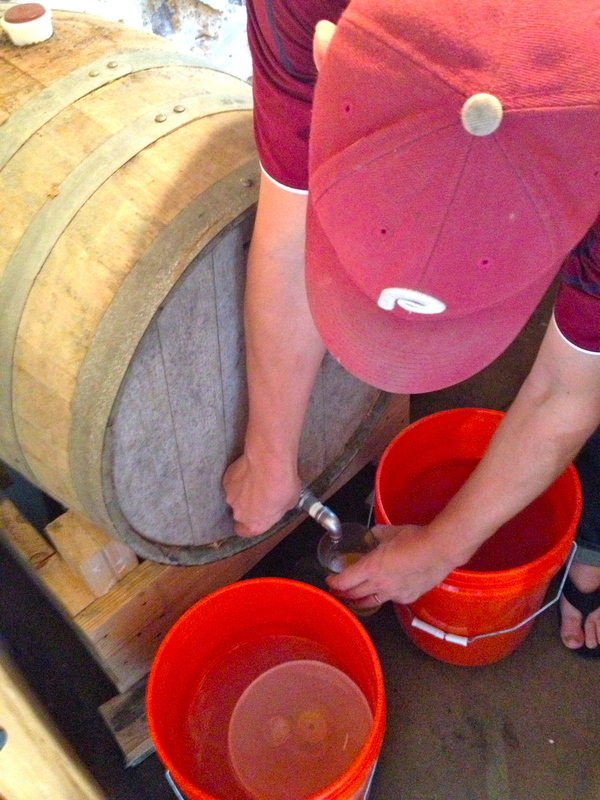 It was also a great opportunity to open some more sour beers to spike the barrels with. A project of this scale is somewhat nerve-wracking by nature, which is why I tend to just not think about it (beyond typical maintenance) and just let the time pass. In this case the Legend of Lambic being insanely difficult to make (likely very overblown), and of the microbes being incredibly finicky (likely also overblown), made for a bit of reluctance on my part. We’ve likely all heard the tales of barrels going off, smelling like diapers (I’ve somehow never encountered this in years of sour brewing), or otherwise being rendered unusable by some invisible malevolent force. As always I braced myself for the worst, and the prospect of having a very uncomfortable rest of the day. Thankfully however, we seem to have made it this far, unassailed by forces unknown, and wound up with 3 very young, but very tasty beers. This makes me very happy for all the obvious reasons, most of which is it seems we have successfully done the job of inoculating the barrels so that the microbes we like are the dominant ones and everything else is keeping out. So far, so good. While of course the desired end result of this project is what we are all really looking forward to, this day afforded us another unique and coveted experience, which is tasting the Lambics still in fermentation. This is an experience I’ve always wondered of, and for which information is somewhat scarce. 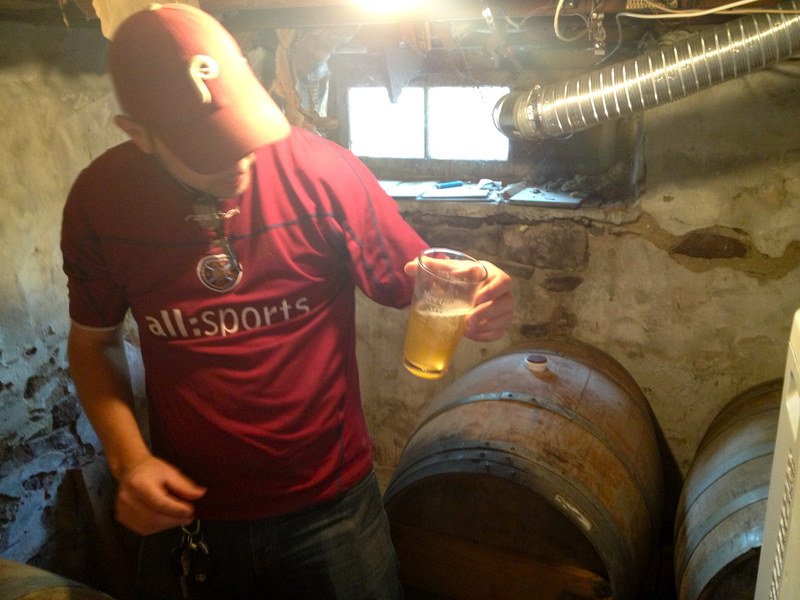 Lambic fermentation in wood is a very different animal than what what souring methods I’ve previously done, which is typically secondary fermentation. In which, you are merely leaving a portion of the unfermented beer for the souring microbes to work with. In Lambic, there is what I often refer to as a microbial cascade. All microbes are added at once, but over months and changing environs, they take turns doing their part in the overall fermentation process. This makes the tasting of in progress Lambic very interesting, as you can note the specific stages each beer is in in the taste, and know what microbes have been the most active. Bread and vague citrus fruit in the nose. Immediate citrus tart blast at first sip, lemongrass and lemon peel specifically. Sour and slightly bitter finish (some aged hop?). Oddly, no real funk to speak of. Bread again in the nose. 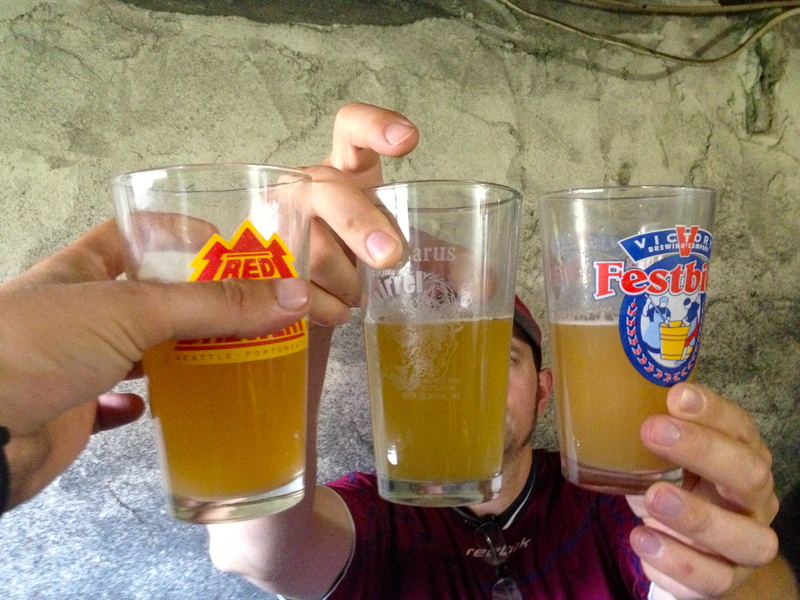 The immediate taste is yeasty, with a faint lemon tartness, stale hops, and a bit of funk. The middle of the taste is all about brett notes, which linger into the finnish with a bit of stale hop funk. Very mellow, light funk in the nose. The immediate taste is sort of like a slightly bretty witbier. The middle of the taste is over ripe citrus, finishing with some peppery notes and a light must of Brett. We passed the glasses around for a bit comparing notes on the taste and letting of palettes adjust before doing an impromptu even blend. The blend was one of the more revealing tests of the day. While each barrel had an aspect or two of the typical Lambic, or Gueuze flavor, none of them on their own was well rounded enough to really evoke the essence of those beers. However then blend revealed a glimpse into the future. Marrying some of the funkier notes of two of the barrels with the upfront tartness of the other, really began to give the taste of young Lambic we were looking for. I’ve tasted enough young sour beer to think that each of these barrels is going to turn out great in their own right. The will all have a different thing going, which is just what we want for a blend. I’m a tad concerned that the sourness is lagging behind schedule, and we may need to delay bottling/re-brewing by a couple months. Not a huge deal, just a bit of a compromise for our timeline, but taste before dates is the way to make sour beer! 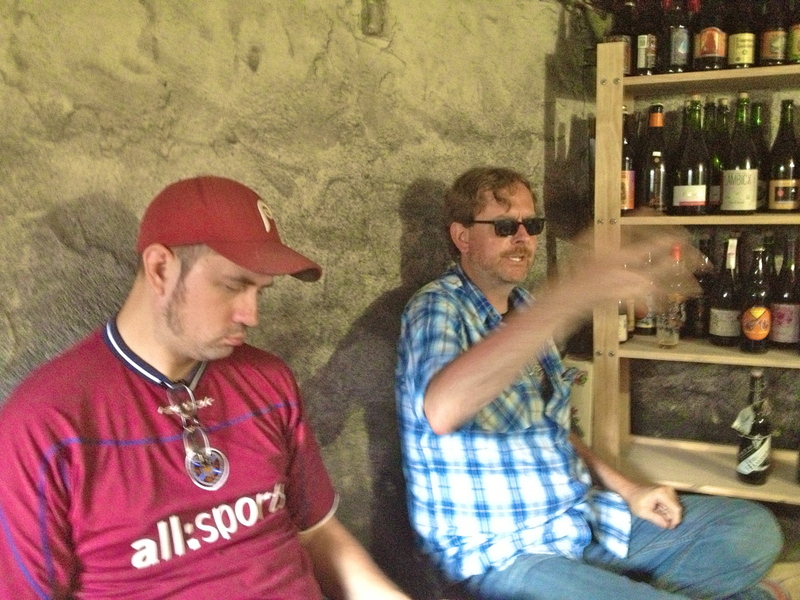 The rest of the day we relaxed in Hatchy’s basement and sampled from his wonderful collection of beers from all over the world. We reserved the microbes of a few of the bottles of Lambic based beers (Hanssen’s Kriek 2010, Hanssen’s Kriek 2008, Drie Fonteinen Oude Gueuze, Drie Fonteinen Schaerbeekse Kriek, Birrificio Del Ducato Beersel Mattina, etc.) to spike barrel 3 with, as it was surely lagging behind in overall character. That is surely also due to it’s relatively young age, but hey, great microbes don’t hurt. Really happy with how the project is going. Here’s to another productive six months for our little microbe friends. More info to come soon about our plans for bottling, and continued aging. Cheers! It’s way better than just cool.